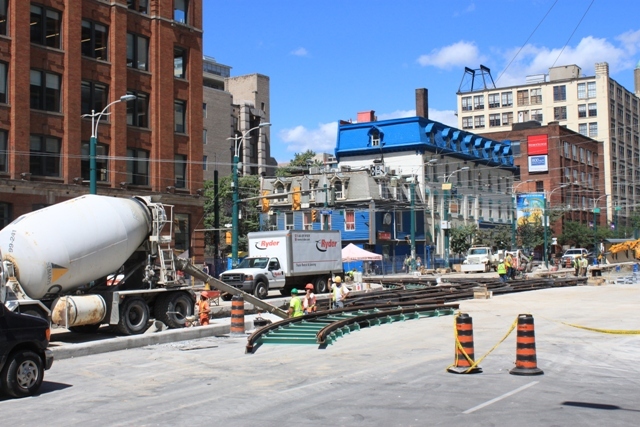 Looking east on King with most pedestrian traffic moved onto the car tracks while work proceeds on the curb lanes and sidewalks. 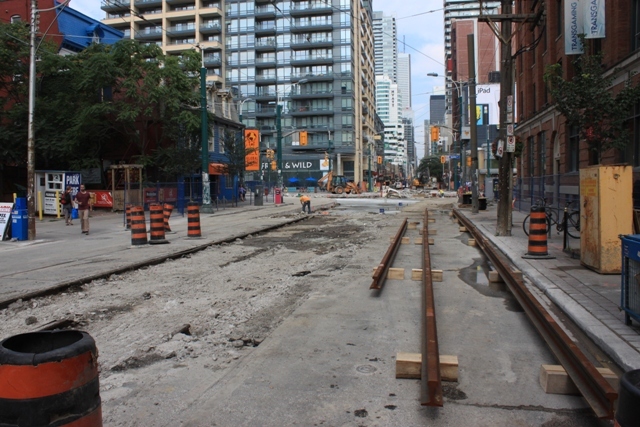 Looking west on King across Spadina. Looking south across the intersection. 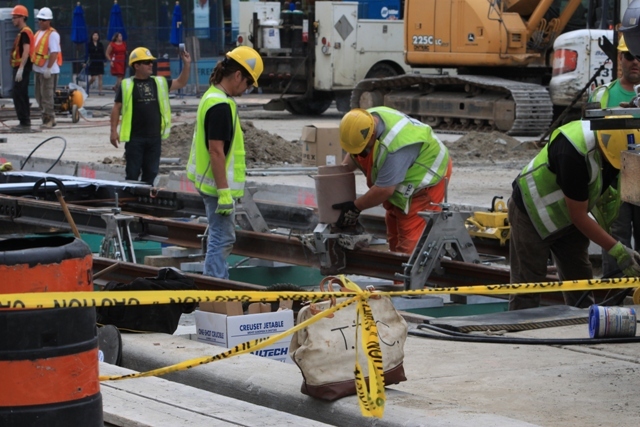 Note the slab in the foreground where new stop rails will be clipped to the existing structure remaining in the concrete from the original installation. This is an example of only removing the top layer of concrete containing the old track, not going all the way down to the foundation, as mentioned in earlier photos of the excavation. 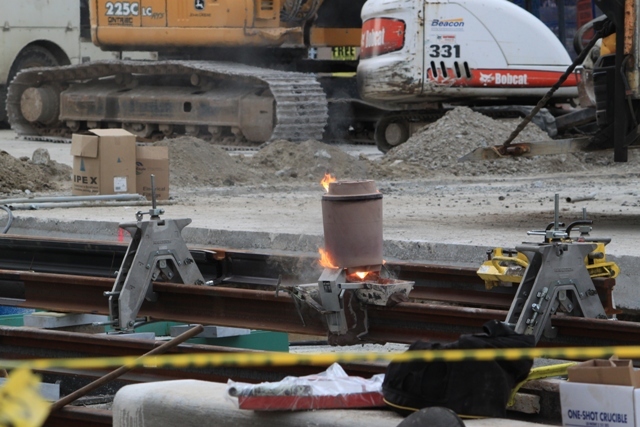 Track sections are welded using thermite charges. 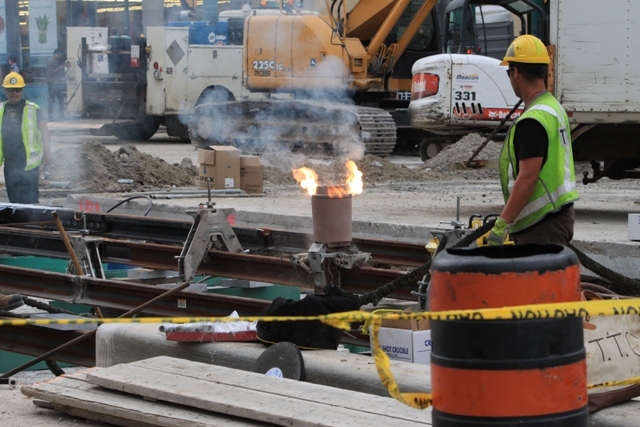 Here, rails at the new joint are held in a jig while a torch heats them to the appropriate temperature for the weld. 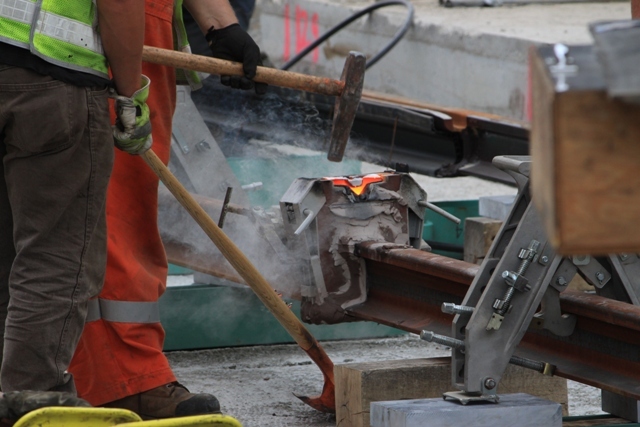 When the rails are hot enough, a one-shot crucible containing the charge is placed on the jig. The contents of the crucible is ignited and, initially, the reaction is contained there. 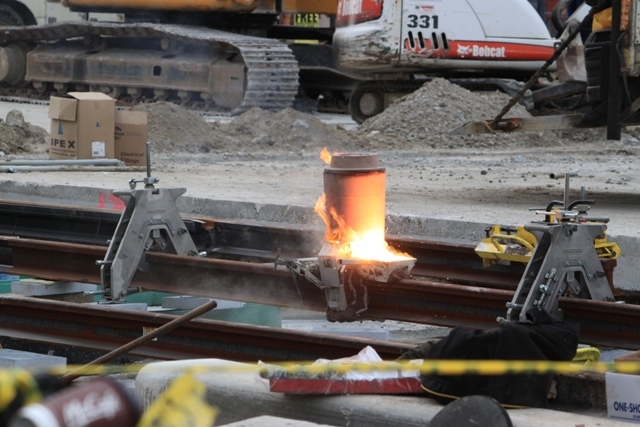 The molten metal that will form the weld begins to pour out of the bottom of the crucible. Just in front of it (to the right) is an overflow bucket to catch excess metal and the lighter slag that is a byproduct of the reaction. The metal flows into the jig making the weld between the rails. A short while afterward, the crucible and overflow are removed along with the jig itself. Also visible here is the form within the jig that held the metal pouring out of the crucible. Excess metal is chipped away from the weld. 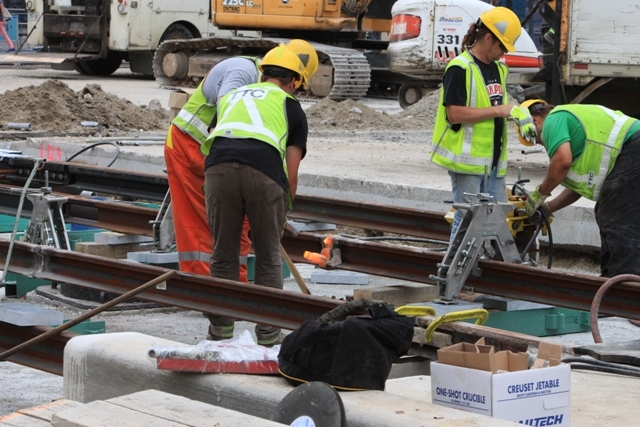 An earlier weld with most of the excess metal removed is visible on the left side on the rail behind the welding crew. This will be further polished to give a smooth running surface. 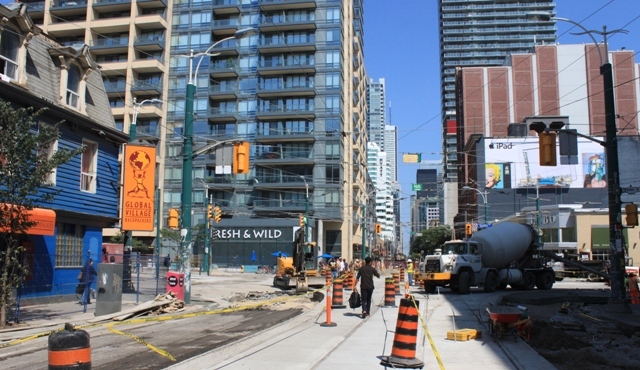 Looking north on Spadina across King. 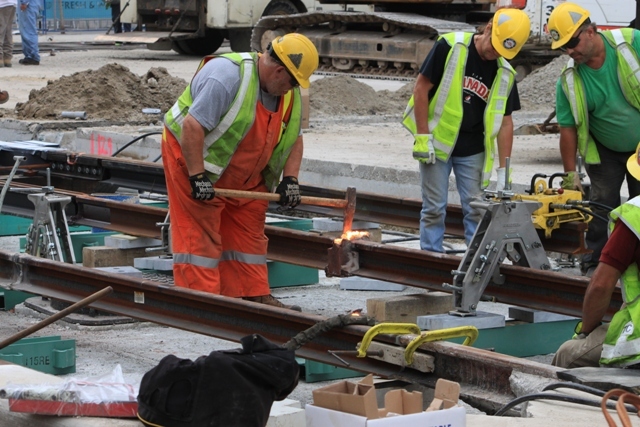 The panel for the northbound trailing switches is being positioned. 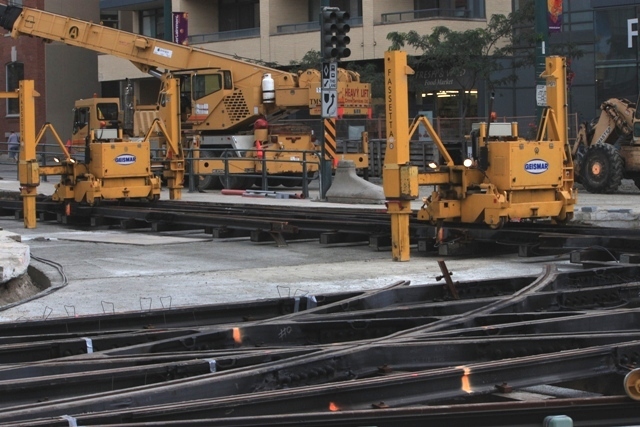 Two track cranes sit on the panel. These are used to “walk” the panel into position. In this view, note that the feet are not touching the pavement. The panel was not in quite the right position when this shot was taken. 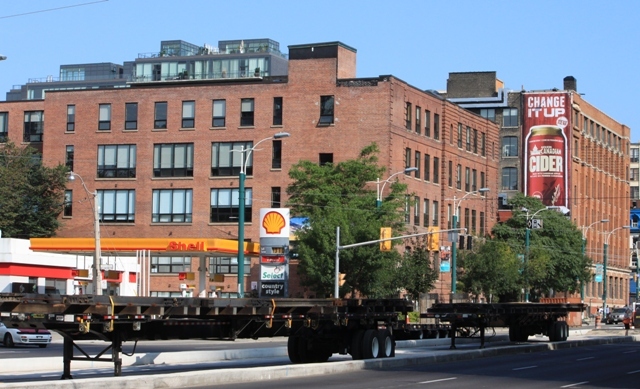 Here, the cranes have lowered their feet and the panel is lifted a short distance off of the pavement. This allows the cranes to move relative to their feet either side to side or forward and back. After a short adjustment, the panel was lowered again and bolted into place. 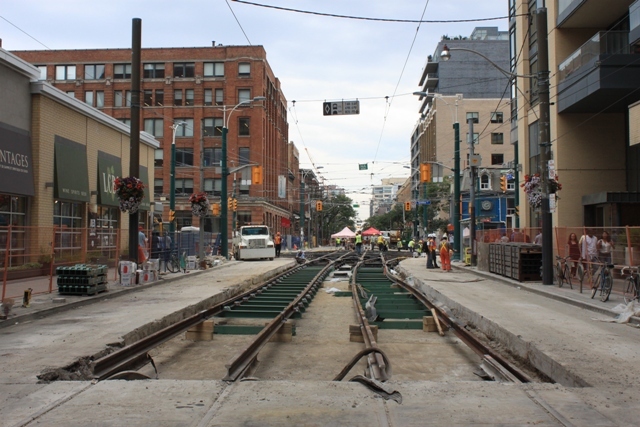 Looking east on King across Spadina. 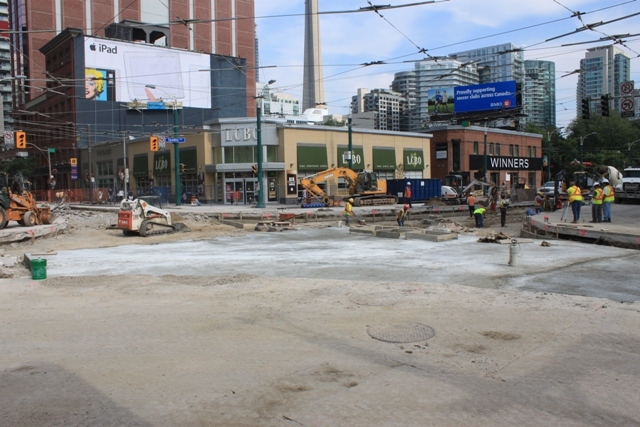 New tangent rails have been placed on the old foundation and ties excavated a few days earlier on the western approach (see August 8). 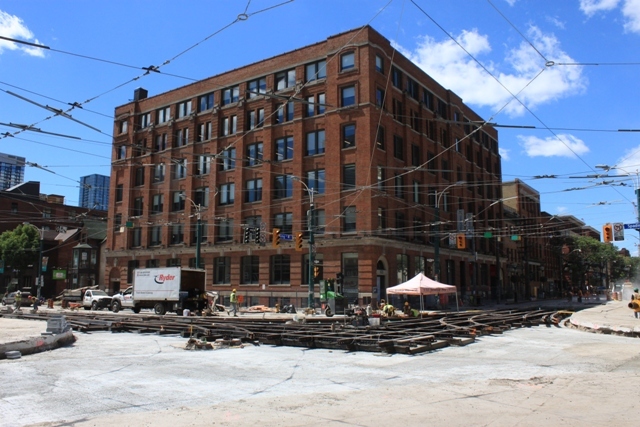 View from the northeast corner showing the half-completed intersection. 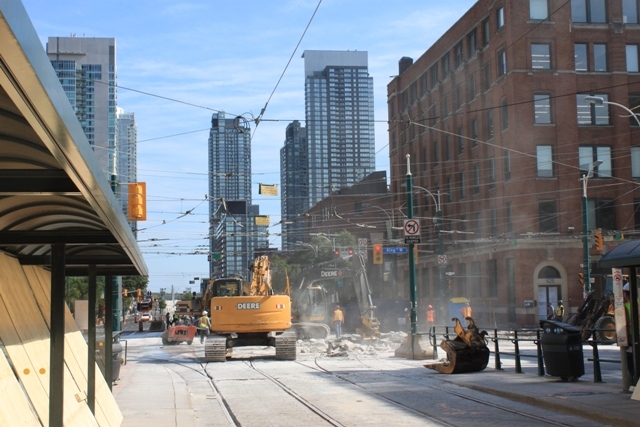 View from the east side of Spadina south of King looking northwest. 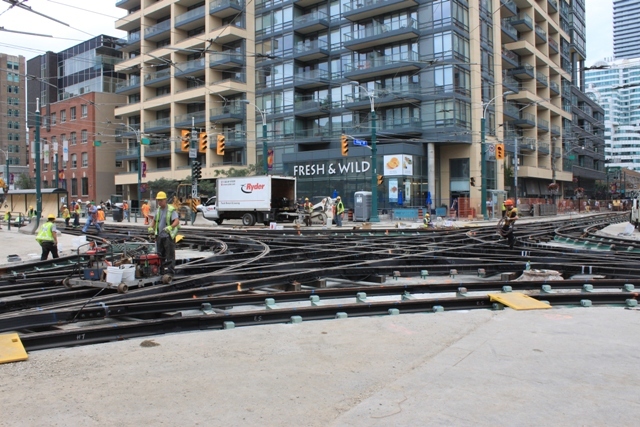 A panel of curved track (reminiscent of a Lionel set) for the north to east curve awaits installation in the foreground. Pouring the foundation slab at about 10:00 am. View from the northeast corner. 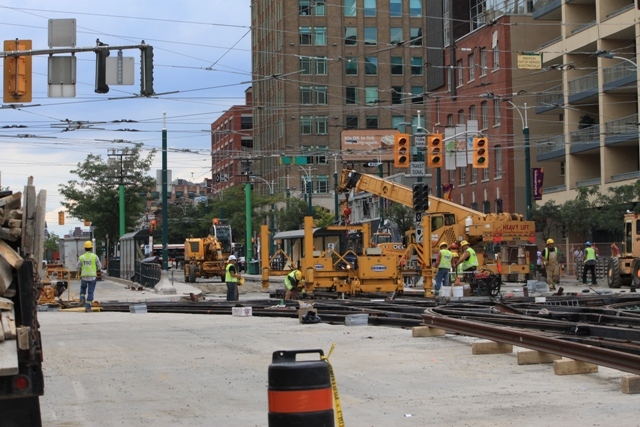 Panels for the southern quadrant are parked on the streetcar right-of-way south of the intersection at Wellington. 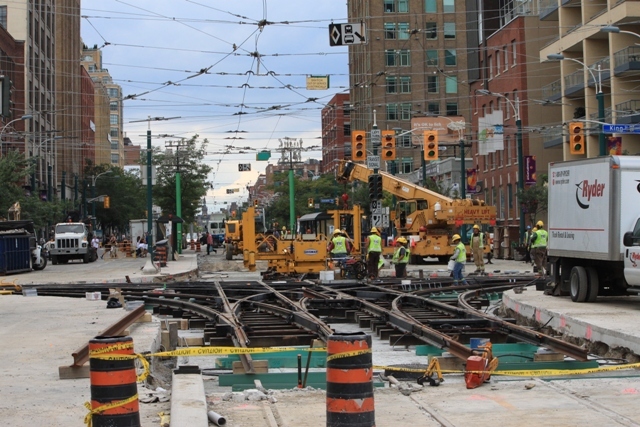 The eastern and western panels are also sitting in their respective locations nearby on King. 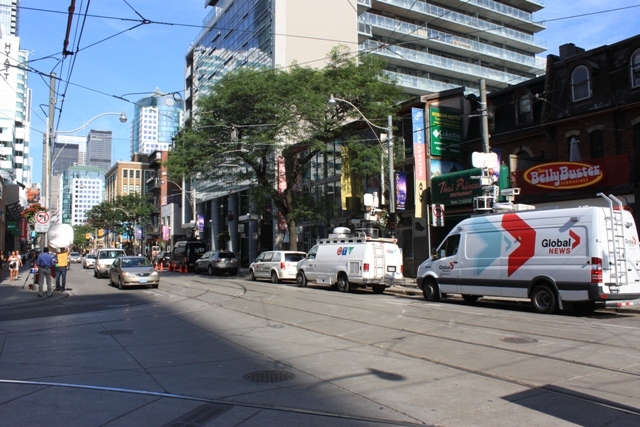 Looking east on King to Spadina at about 5:00 pm. 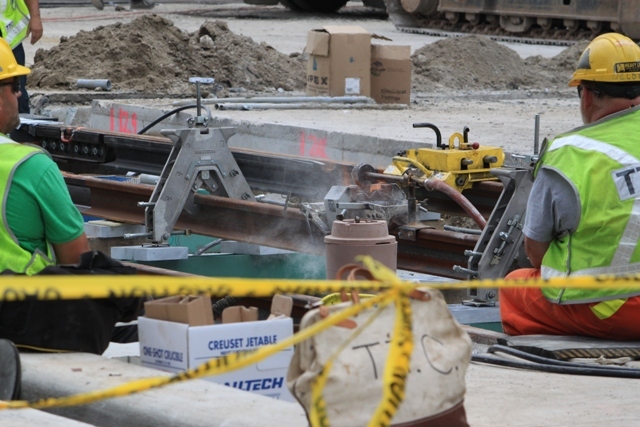 New rails for the eastbound stop have been placed in the curb lane, but they are not yet welded together. Note that the excavation has removed only the top layer of concrete. 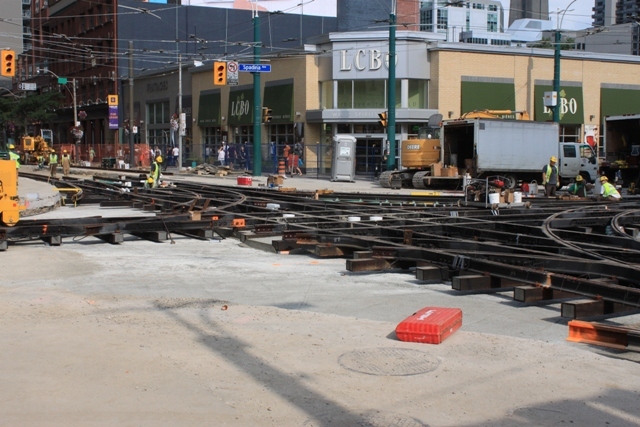 Invisible under the rubble are the steel ties with Pandrol clip mounts to which the new rails will be attached. Looking southeast across the intersection at about 5:00 pm. Surveying is in progress to re-establish the location of the track panels (some of the original survey marks vanished when the pavement was ripped up), especially the critical diamond that will sit in the middle of everything and off of which the entire assembly will be built. 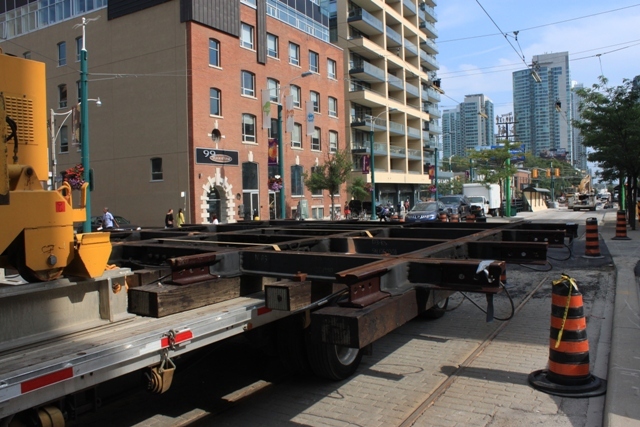 The panel containing the diamond sits on Spadina north of King awaiting installation. 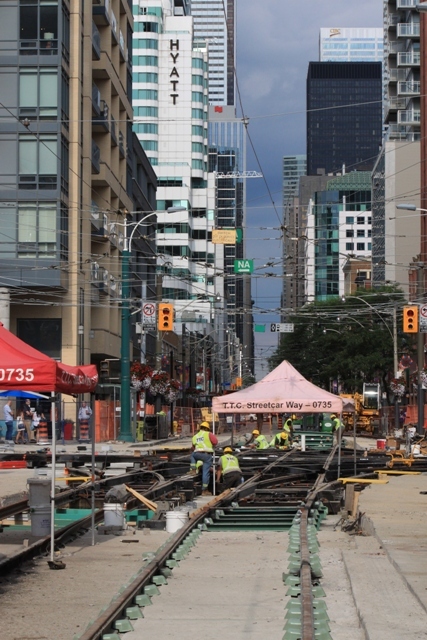 Looking south on Spadina toward King at about 5:15pm. 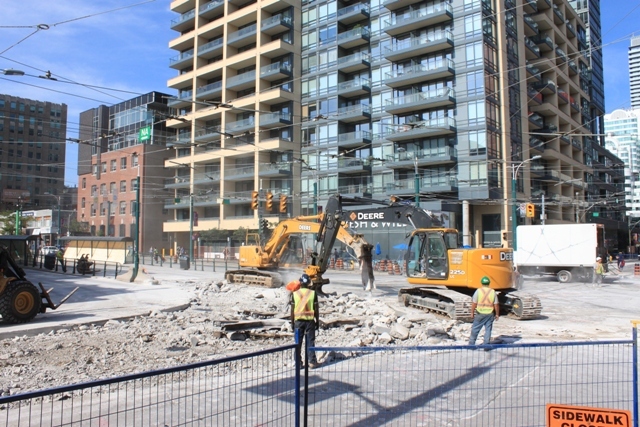 Demolition work began after the intersection closed at 10:00 am today. 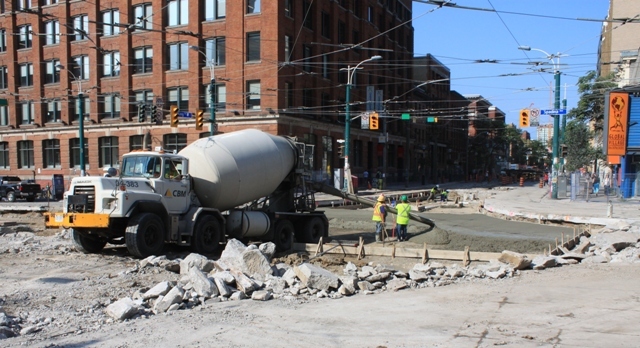 It was a slow news day, and no fewer than four TV stations attended to report on the construction and its effect on downtown. The CBC’s Steven D’Souza stands on the northeast corner of Charlotte and King as the shadow of a condo slides across his shot. I have noted in various places that “new” track requires removal of only the top layer (of 3) in which old track was built. Here an instruction to the demolition crew shows where this should be done at the carstops north of the intersection. 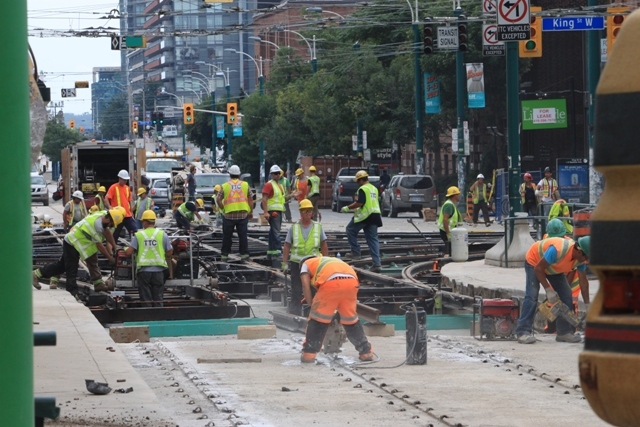 The main part of the intersection will be completely removed to allow its replacement with “new” style track. Typical stop pole signage, this one westbound at Simcoe. 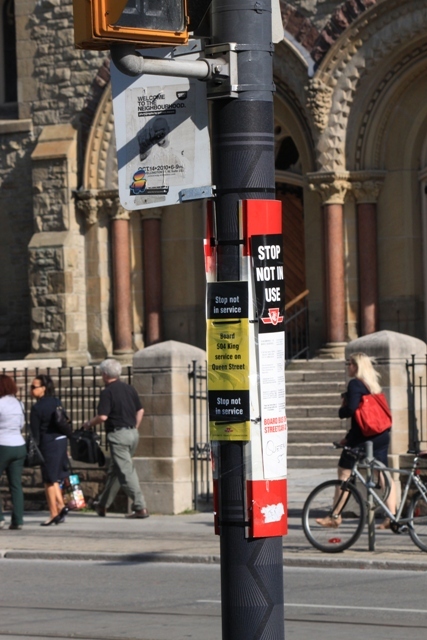 The “Stop not in use” card tells people to board cars on Queen Street, but the yellow sign does a better job. These are at most but not all locations. Large placards are in subway stations but not on transit shelters where they exist. 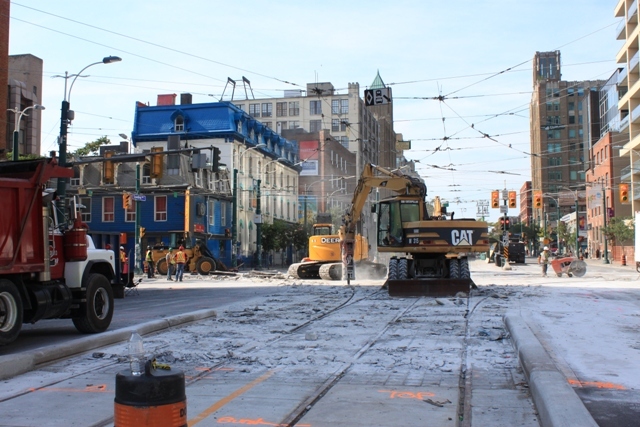 Some riders are lost, but a lot are just walking along King rather than going up to Queen where, because of the scheduled service levels, there are now actually more King cars than Queen cars. This entry was posted in King Car, Spadina Car, Transit. Bookmark the permalink. No, Steve, I never found the elimination of route names to be one of the TTC’s better ideas. I thought they could’ve at least kept the names on subway station signage and places like that. Or they could’ve reduced the size of the numbers and put the route names under the numbers. Sure, they’d have been on the small side it sure would’ve beat the juice out of what was done. I’ve thinking that since the new cars will be getting electronic destination signs, that would be a golden opportunity to have route names and numbers both at once since the signs can display anything one would want them to.